One of the best things about playing sport outside the big cities of Australia is the home-spun community spirit that welcomes you. Every footy club, bowling green or golf clubhouse around the country has it like a municipal bearing for the out-of-towner. Whether it’s the old bloke taking up his usual station at the bar he has run for 30 years, the dutiful nod to past local glories on the honour boards or even just the chook raffle – a welcomed sense of familiarity awaits. The scene could be replicated in any number of towns across the country and, for many Aussies, that’s the allure; it’s like walking into a home from home. Protecting that institution has, however, become increasingly more difficult with the emergence of modern-day luxuries that stop too many of us from leaving our own four walls. But for Geraldton Golf Club, finding a way to tap into that civic pride might just have saved the club. Only two years ago, Geraldton GC was in a dire financial position with its future in grave doubt. “The club couldn’t afford to pay their staff,” said Sue Douglas, who has helped to revive the club’s fortunes since taking over as secretary-manager in 2015. “I’m reluctant to say the club could have dissolved, but the potential was certainly there. Discovering the pathway to that ‘long-term fix’ has proved to be the return-to-basics adventure that arguably should act as a blueprint for clubs across the country to follow. The journey started almost by accident following a routine meeting with GolfWA as part of the Club Health Check programme. There was no silver-bullet fix in the meeting, rather an honest assessment of where the club was headed, and reassurance support was available to institute a recovery plan. “It was a bit of a coincidence that GolfWA came out at that time, but it was the kick up the backside the club needed,” Douglas said. Geraldton’s revival since has centred around giving their membership control of driving the club forward. But before that could take hold it required significant work behind the scenes from the committee as they had to tie down some major loose ends. Douglas was brought into her role soon after the initial meeting with GolfWA and, with the stage set to pair things back to basics, she realised some common-sense strategies first needed to be instituted. “Updating the membership was one of the first and simplest jobs,” said Douglas, a book-keeper by trade, and who can recite how many members are on Geraldton’s membership without hesitation. “Three-hundred and thirty. That’s the exact figure. “Before they didn’t know that sort of figure and that was a problem. The membership database wasn’t being updated – it said the club had about 30 to 40 more members than it actually did, which made budgeting impossible. Creating links with the community has been central to increasing cash flow via sponsorship and bringing a more homely feel to operations. “Out of all our golf days there’s probably only 20 rounds of golf that don’t have a sponsor,” said Douglas, who estimates the sponsorship dollars, including the value of trophies supplied, are worth a five-figure sum. “We have hole sponsors, we have car park sponsors, we’ve got nearest-the-pin sponsors and we have daily sponsors. How you go from a perilous financial position to sponsors beating down your door is the million dollar question for many clubs around the country. Douglas said tidying up those basics has proved crucial – in addition to a membership base that has been fully supportive of their plans. An important part of that was providing a streamlined membership structure that made more sense to both the members and club. “We had so many different classes and options – it was huge,” said Douglas, who with the club, consulted MiClub when simplifying the memberships. “We had a chat with Peter Maddison from MiClub and then elected to bring in that Lifestyle Membership – in addition to more traditional full memberships – which is a points-based membership. It has been fantastic. “It’s not a full membership, but it still gives you playing rights and allows you to be on the course whenever you want to. But when you are on the course you lose a proportion of points. “With Geraldton some of the conditions that we’ve placed on it is that you can’t win Honour Board events and that you are a non-voting member of the golf club. Laying down best-practice procedures has also been vital in allowing the club a solid base to then go out and convince sponsors, and members, that they are moving in the right direction. “A lot of the things that were taken for granted are now more structured. I think that’s what the members appreciate too,” Douglas said, who shares her all-encompassing role, which takes up 20 hours a week each, and includes everything from sponsorship to fixtures as well as covering the finances and secretarial work. “At the moment we’re re-writing the constitution because the Incorporations Act has changed and because governance is the big boom at the moment. “All that has to be implemented and the stuff that’s not implemented has always just happened – we’re starting to document that and put good procedures in place. “Our next big thing is going to be a Strategic Plan. I’m working closely with one of the committee members at the moment with a Strat Plan that is 2020 and beyond. 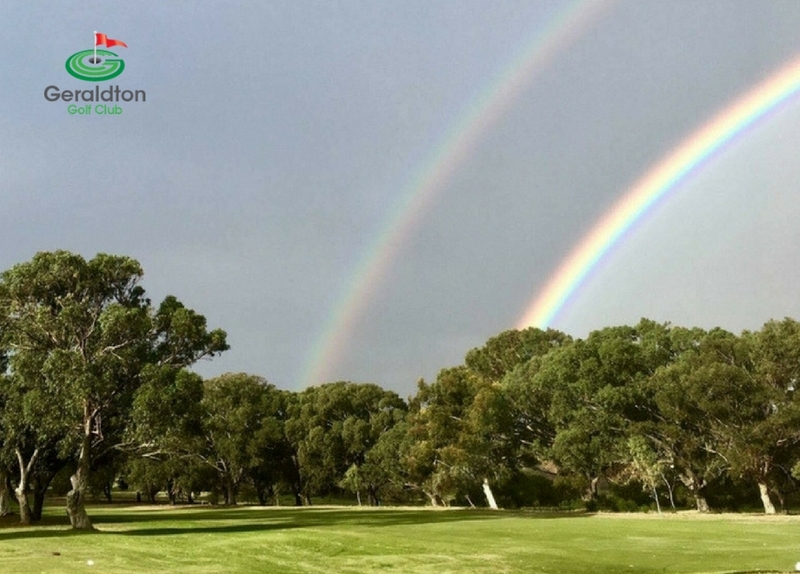 It is that forward-thinking that has members and sponsors eager to be a part of Geraldton’s revival and the green shoots of recovery – quite literally – are evident in simple things such as the course condition. “The course looks amazing compared to two years ago,” Douglas said. “This can be attributed to the course staff along with the multitude of volunteers on the course helping out the staff by doing tree pruning, slashing, mowing and rolling greens and also raking bunkers has helped a lot as well. “This year we’ve bought three new pieces of equipment for the course. We paid cash for them and we’re financing a new tractor that’s coming in as well. “We wouldn’t have been able to afford that, two Toros and a blower for the course, before but with the members volunteering it has made things like this possible. Geraldton have also been savvy with the money they have, not only utilising GolfWA’s expertise, but also programmes such as ‘Work For The Dole’ and government grants that help get the most bang for their buck. “We utilise ‘Work For The Dole’, through Job Active, quite a bit because we can get additional workforce for 15 hours a week,” said Douglas, who can also point to the fact the club recently employed one of the ‘Work For The Dole’ members to a full-time contract as further evidence of what the club is giving back to the local community. “In reality you have to say you’ll take 15-20 to get six to show up, but that’s fine and they’re now looking at doing the extensions on the clubhouse balcony and stuff like that. “That will be their project and we’ll be able to get funding for some of the materials and equipment to build it – like if they need circular saws or any tools that we don’t have. GolfWA also helped with a grant applications to the Department of Sport and Recreation, and with letters of support, to fund reticulation on the course. “The investment is a third, and a third and a third. So it’s a third from DSR, a third from local council and a third that the local golf club had to put in,” Douglas said. “We had to prove that we would be able to pay it back – previously it would have cut to the bone. While the Geraldton committee can be rightly proud for the improvements that have been made, Douglas admits the most important factor in driving long-term success has been the members taking control. “We’re lucky that we have really great members who have always looked out for what we’re trying to do,” Douglas said. “At the start of this we introduced a levy – and Geraldton does not do levies – but there was a 98 per cent take-up from the members. They’ve always been supportive. “But now they can also see that things are happening and that there’s a direction and they know any money isn’t just filtered into the general funds – it’s being well utilised. “The members taking ownership of what we’re achieving is vital, it’s what we want, and from that aspect they’ve started to come up with little things of their own. Geraldton’s success has allowed them to start thinking beyond their membership base and another of the big questions facing golf – how to attract a new breed of golfers to the club. They are blessed with a proactive club pro, in Daniel Bennett, who has actively sought new players to the game. He recently conducted an eight-week course targeted specifically at players new to the game, while he runs a junior programme that has 10-15 primary school-aged children. The club also runs a ‘Nine at Nine’ programme for female golfers who get a lesson from Bennett in addition to playing a relaxed nine-hole Ambrose. “Daniel is great he works hard to offer what people and the members want and he actively promotes it on Facebook and anywhere he can,” Douglas said. “You need a good golf pro to do these types of development programmes and Daniel is very good. “We are getting more people down to practice on the range or play socially so now it’s about that next step. “But when you look back it’s hard to imagine we’re able to be in a position to think about these things like purchasing new machinery and building extension but these types of things come with the security of our finances. “And everyone is happy. All the numbers on everything are up. Membership is slightly up. It’s about maintaining and for us, maintaining is good. In reality there’s not a huge room for growth. Our focus now is trying to attract younger members – how can we do that? “That’s our next thing because golf is an ageing sport, so we’re trying to find ways to attract younger people. We’re trying to identify a point of interest so that we can get younger members in. “We’re trying to figure it out. People are time poor. Given Geraldton’s success rate so far you suspect there’s every chance they will.